After I build the roller coaster, should I bother with Krustyland? Once you finish building the roller coaster, you’ll only have one more task in Krustyland to finish out the quest line. All you have to do is send Bart to ride the roller coaster once, and you’re done. After that you can exchange your tickets for cash at the Krustyland Entrance. While it is possible that more content will be added to this area in the future, there is also a possibility that this is all there is Krustyland. Why else would there be an option to liquidate your tickets into usable cash? 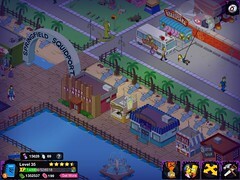 For me, I have plenty of in-game cash so I’m keeping a reserve of tickets in Krustyland should more content be added to this area in the future. Even if you’re finished with Krustyland you should go back every eight-hours, just to pop some balloons. Why? There is a marginally small chance of winning 5 donuts from the Sideshow You game.